Rivers’ longest connection was a 59-yard pass to tight end Hunter Henry and he also had a 54-yarder to Travis Benjamin. Both of those were of the shorter variety as the Raiders’ secondary struggled to make tackles. But Rivers also hit Tyrell Williams deep twice. There was a 29-yard touchdown in which he blew past the coverage of cornerback David Amerson and safety Reggie Nelson. Later, Williams got deep again on Amerson and Nelson was late to react and provide the help and the Chargers connected on their third 50-yarder of the game. 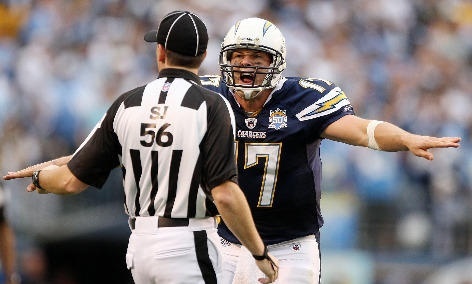 Don’t think Rivers won’t remember the success he had attacking down the field. Raiders cornerback Sean Smith said it didn’t bother him “not one bit” how openly Rivers spoke about attacking Oakland deep. Amerson, who obviously struggled in that outing, also dismissed what Rivers had to say — particularly because the Raiders won 34-31. Smith was tested deep early in that game, but he read and was able to pick off an underthrown pass to Benjamin for a first-quarter interception. Rookie safety Karl Joseph, who is unlikely to play this week with a toe injury, also picked off a deep Rivers pass just before halftime. That’s part of the Rivers’ conundrum. He’s fourth in the league in both passing yards and touchdowns, but has thrown an NFL-high 17 interceptions. The Chargers as a team lead the league with 30 giveaways. That’s the Rivers the Raiders are looking forward to seeing. “We know if he’s going to go out there and just throw the ball crazy, just throw it up, we’re going to make him pay,” Amerson said. The Raiders also have a pass rush that’s in better shape. They remain near the bottom of the league with just 22 sacks — only the Cleveland Browns have fewer — but Khalil Mack has a sack in eight straight games and a strip sack in three straight. He thinks they’ll be ready to slow down the Chargers deep game. — Raiders defensive tackle Darius Latham said he will make his return when his team faces the San Diego Chargers on Sunday. Latham had played in the first 12 games as a rotational lineman and has 12 tackles on the season. While the stats are modest, Latham is a big-bodied presence who has been able to provide decent push up front when he’s out there. He’s happy to be back for the stretch run. — The Raiders injury report was unchanged from Wednesday. Latham, wide receivers Amari Cooper (right shoulder) and Michael Crabtree (left ring finger), left guard Kelechi Osemele (knee) and linebackers Malcolm Smith (hamstring and Perry Riley Jr. (hamstring) were all limited. Safety Karl Joseph (toe), defensive tackle Stacy McGee (ankle) and linebacker Shilique Calhoun (knee) all did not practice. Derek Carr (right pinkie) was a full participant. Why does the Media always fail to mention Musgrave when talking about good young coaches out there?? Musgrave has one of the best and most exciting offenses in the league.. And that’s a fact..
And we average 28 or so points a game.. Imagine if Musty opened up the playbook?? 50 points a game?? It’s a big game no doubt, but the biggest since our SB run?? Well i guess since a win would clinch a playoff spot..
Hi Gang, I miss you guys. I thought they closed this site down. Went to Pillaging and another site, but they were hit and miss with posts being a few days old. Why isn’t anyone going to East Bay Times or Mercury News? Good articles. For all of you I go to Silverandblackpride.com, great articles and a good cast of characters posting. Give it a try sometime. Bull Crap – Pillaging has fresh content and it is inclusive of the fans. I can’t believe I’m saying this but Skip Balless was great compared to this politically correct turd Kellerman. SB Pride is pretty good.. But Durkin, JerryMac and crew are better..
JFB says a lot of stuff, a lot of it on point too.. But i don’t agree with him on this one..
Yeah, Skip was better than Kellerman.. So no MEJ against the Bolts.. Yeah i didn’t think so, he’s not there yet.. We might see him against the Colts, but it’s a lock that he will play against the Donks to close out the season.. While it’s awesome to get a talent like MEJ back, we just need to ease him back into the lineup.. We get Latham back for this game, and he’s pretty good too, so at least there’s that..
You never forget your first love. Long live IBA !! I’ve been reading this blog for a LONG time, then finally decided to join the fun.. And now that some feelings got hurt nobody wants to post?! SMH!! This blog is legendary!! I just call it THE BLOG!! Some of the best bloggers on the NET were MADE on this blog..
How much do the Raiders players respect Charles Woodson?